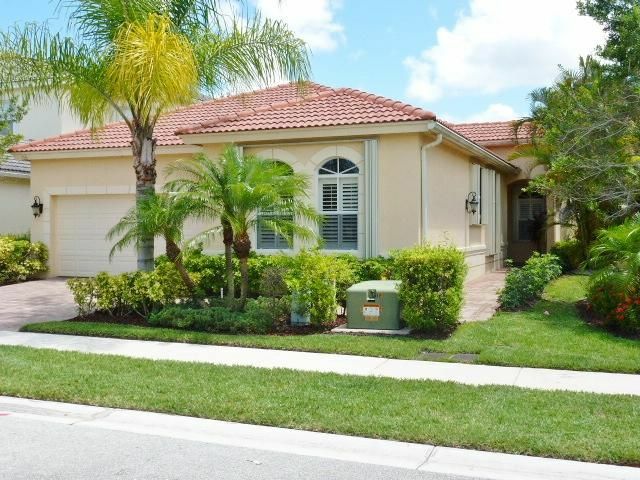 Solidly built 3 BR+DEN/Office/4th BR modern home w/ FULL ACCORDION SHUTTERS features extended great room, Large island kitchen with GAS COOKTOP, DOUBLE OVENS, Luxurious Granite counters, CA closets in Master. Ceramic tile on diag in main living areas, custom mirror and pedestal sink in half bath, custom lighting, central vac. 24 Hr manned gated community, elaborate clubhouse with resort pool, kiddie pool, tennis, fitness center, aerobic room, youth center with playground. On private cul-de-sac street. Upgraded cable and alarm monitoring included thru HOA. Freshly painted, new carpet in master. Easy to show. Mirabella HOA and Master Association charge a one-time capital contribution of $2500 combined ($1750/$750). HIGHLY MOTIVATED SELLER, BRING OFFER!